These insectivores live 50 feet or more above the ground in the rainforests of Central and South America. The red-eyed tree frog lays its eggs in a gelatin base on the underside of leaves. After a week or two, the tadpoles hatch and wiggle until they drop into a pool of water below, where they become frogs. 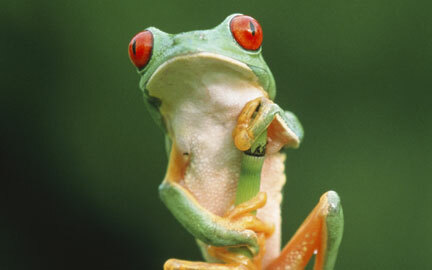 Red-eyed tree frogs are threatened by habitat loss.